A modern look. Performance you’d expect. The Vago offers a single-line launch and retrieval system for the gennaker as well as interchangeable sails that don’t require extra rigging. Its high boom, GNAV vang, and cockpit design support both hiking and trapeze options. The robust Polyethylene Tri-skin hull keeps maintenance to a minimum. More importantly, its innovative hull features a sub-chine area designed to promote controlled planing, ensuring every ride is a blast! 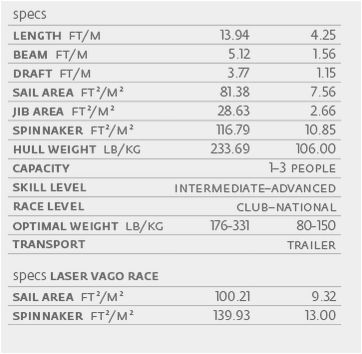 Metal gudgeon plates to suit the Laser Bahia and Vago sailing dinghies. Use the same part for the top and bottom gudgeons. Holds the rudder pintle on the transom. The replacement Halyard Bag to suit the Laser Vago sailboats.